Hope you’re all enjoying nice weather on the beach this month. We’ve had a great few weeks at COASST with refresher trainings in Westport and Long Beach, WA. Thanks to those of you who came out to join us. It was great to see you! For those of you in Alaska, we’re headed your way! Over the next 2 weeks, we’ll be in Kodiak, Homer, Seward, Yakutat, and Sitka for COASST trainings. 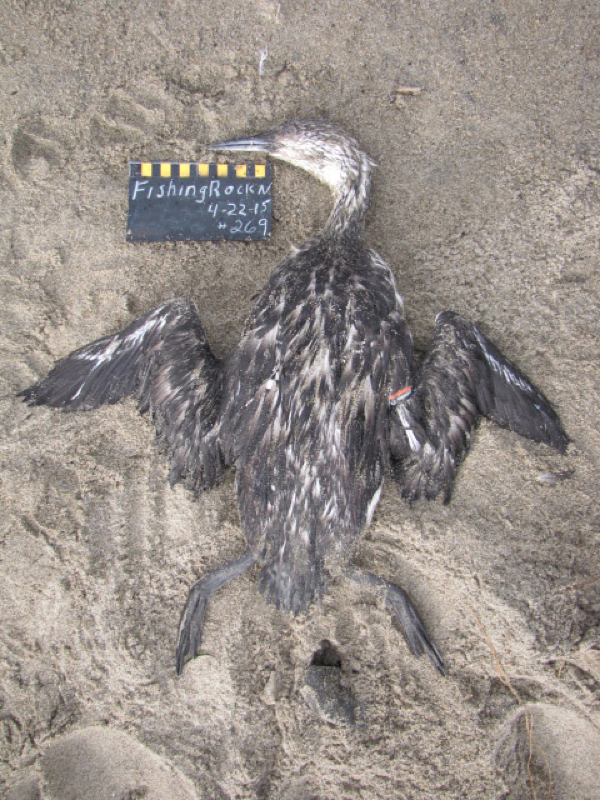 In Sitka, Julia (COASST Executive Director) will also give a talk on “The Natural History of Dead Birds” as part of the Natural History Seminar Series coordinated by the University of Alaska Southeast and the Sitka Sound Science Center. As we approach the end of the month, if you have any datasheets or photos sitting around, please send them our way. We’d love to see them! Choose webbed (go to Q2), choose completely webbed (go to Q3), choose 4 toes: 3 webbed, 4th free (go to Q5), choose tarsus not more than 12mm across (go to Q6), choose 4th toe lobed, with flap extending to end of nail – STOP: Waterfowl: Diving Ducks. On WF1, select “plain bill” and continue to WF2. Wing has white in the speculum and a white patch – SO many choices: WF15, WF19, WF25, WF29, WF31 and WF33. Hey! That wasn’t so bad – only species fits that wing chord: Bufflehead. On WF1, select “white in wing” and “plain bill” – WF13, WF15 and WF23. Great! The wing chord proves this is a Bufflehead. Choose webbed (go to Q2), choose completely webbed (go to Q3), choose 4 toes: 3 weebed, 4th free (go to Q5), choose tarsus more than 12mm across – STOP: Loons. Bill is straight, no spotting on back or wings, so not a RTLO. Between Pacific and Arctic, we need the ventral side, to see the dark stripe between the feet. Fortunately, the tarsus is also a bit too long for the Arctic Loon (53-65mm) so Pacific it is! On LO1, bill is less than 60mm and straight – Pacific Loon – easy! Have you ever found one of these and wondered what it was? 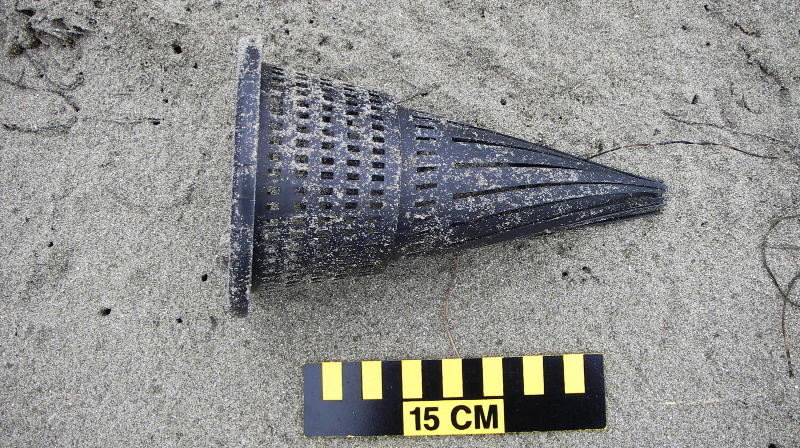 Components of a hagfish trap, shown above, regularly wash-up on COASST beaches. 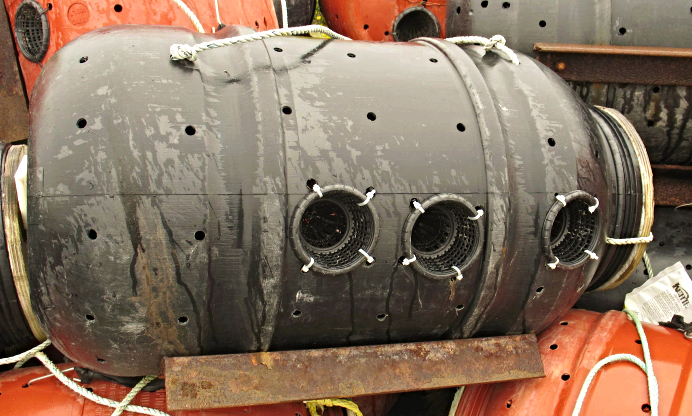 Bait is placed inside the barrel and the “slime eel” swims in through the opening of the cone then can’t get back out. The catch is exported to Asian markets. Have you ever seen this animal on your COASST survey? 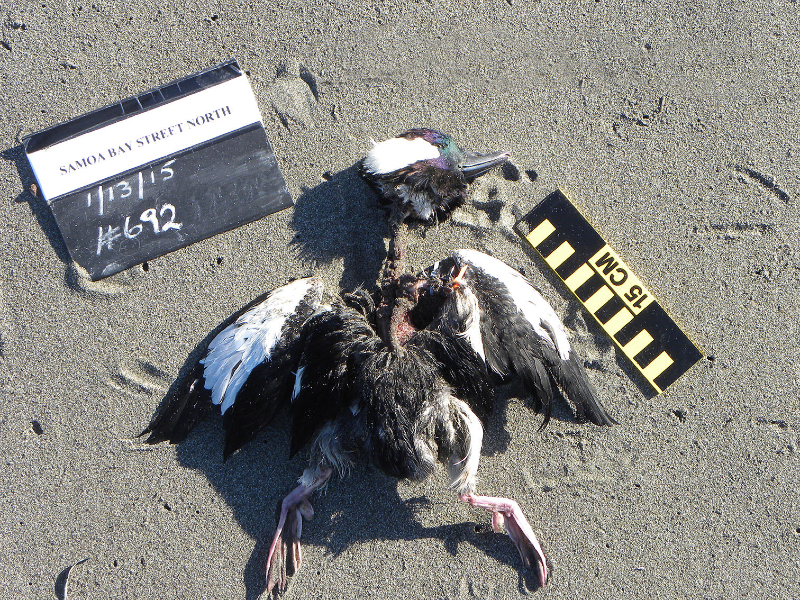 Here’s a photo of one found by Linda at Short Beach in Oregon. 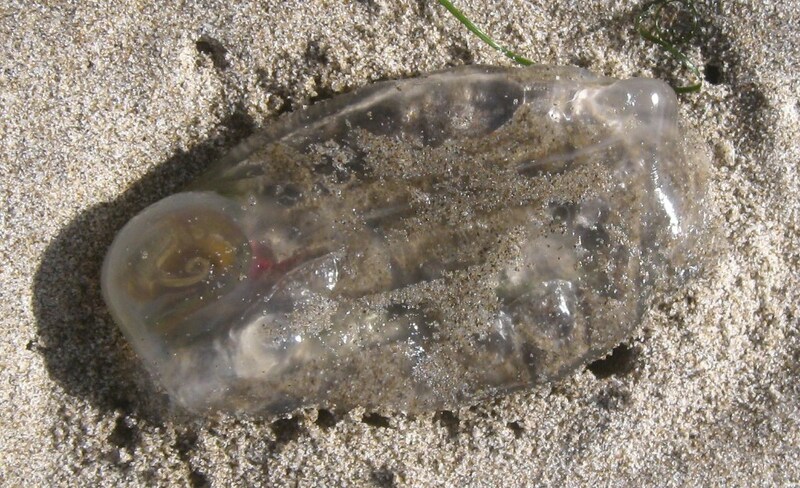 Even though they may look like jellyfish with their simple gelatinous form, these barrel shaped gelatinous creatures are actually tunicates or saclike filter-feeders known as sea salps. Salps are about 4 inches long and pump water through their gelatinous bodies as they move, catching food in the process. Capable of fast asexual reproduction, sea salps can form large communities, linking together in long luminous chains sometimes more than 4 meters long under water. This entry was posted in Uncategorized on April 28, 2015 by coasst.